Website design Sugarland TX – Structural design companies. VISIONEFX developed a unique homepage animation using shapes and angles. One of the best things we can say about Visionefx is that many of our customers are repeat customers who enjoy our high standards of service. VISIONEFX Web site clients include start-ups, established small businesses with 10 to 200 employees and all types of businesses in-between. 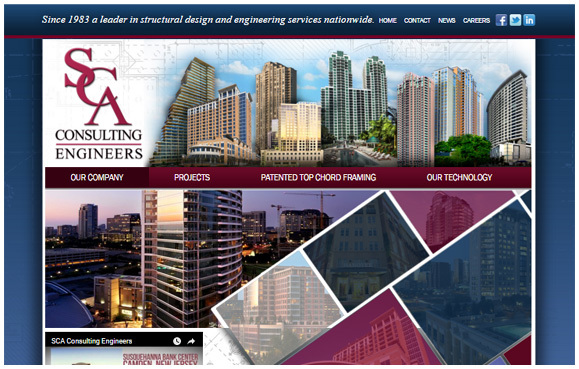 SCA Consulting Engineers has offices in Sugarland and Dallas, TX. Searching ‘Website design Sugarland TX’ find the web design experts at VISIONEFX. VISIONEFX, a Web design company based in Virginia provides extraordinary web design for small and large businesses throughout the United States to include; custom web design, web development, e-commerce web design, Word Press web design, Joomla web development, SEO and web maintenance services. Call: (757) 619-6456 or email info@visionefx.net.